Two weeks ago, Peter Barlow stumped nearly everyone with a photo of a spire that — until it was knocked over in a hurricane — stood with a dozen others atop the Compo Beach bathhouse. Last week’s Photo Challenge also came courtesy of Peter. This one was much easier: the cupola at Kings Highway Elementary School. Though they showed different images, and were orders of magnitude apart in difficulty, they share one thing. Is this week’s Photo Challenge as tough as the bathhouse spire, or as easy as the Kings Highway cupola? We’ll find out. If you think you know where in Westport you’d find this, click “Comments” below. This entry was posted in Beach, Education, Photo Challenge and tagged Compo Beach, Kings Highway Elementary School. Bookmark the permalink. Just curious: do you have a garden plot there? Because, if not, that is an impressive guess. And I think you’re right. Aerial view of Community Garden at Long Lots School. That’s a lot of gardens, if that’s what they are. How big is each plot? The aerial view looks like the kitchen linoleum my mother used to have. Peter Barlow, a full plot is 10′ x 40′, but half sizes of 10′ x 20′, are available, too. There is an annual fee and each member is required to donate some time to maintain the Garden as well as follow some reasonable rules. I love it because I have almost no room for a garden at my home and I can grow anything I want, flowers, vegetables and more. The chance to interact with other gardeners, to share ideas, experiences, even seeds and plants, makes gardening there even better. too bad we cant really zoom in on it…. Arial view photos in town hall?? 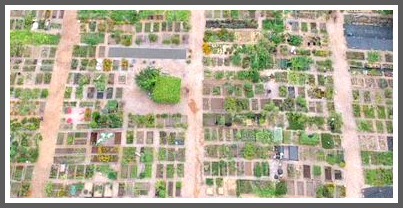 It’s an aerial photo of the Community Gardens next to Long Lots School. Yes, you guys are right! It’s a drone photo of the Community Garden next to Long Lots School. How the hell could you tell?! and spoiler alert: if you click on the photo as if to save it, the name of the photo is cgarden! Wow! What a spectacular thing, this Community Garden! This property used to be owned by the Jaeger family, with a small house on it and enormous greenhouses for their flower business. Does anyone know…did they donate it to the town or sell? And who’s wonderful idea was it to do the Community Garden? What an amazing asset for the town!! !